Wee presents the Boys Group B best swimmer award to Hii Puong Wei of Kotas. KUCHING: The increase in the number of younger participants in the Sarawak Age Group (SAG) Swimming Championship augers well for the future of the sport in Sarawak as it gears towards reviving its status as a swimming powerhouse in the country. Amateur Swimming Association of Sarawak (Asas) president Dato Wee Hong Seng said in the 52 years of Sarawak competitive swimming, Asas had always been focusing on grass roots development of age group swimming. “In recent years, Asas faced some daunting tasks and more so with the addition of swimming pools in the state. 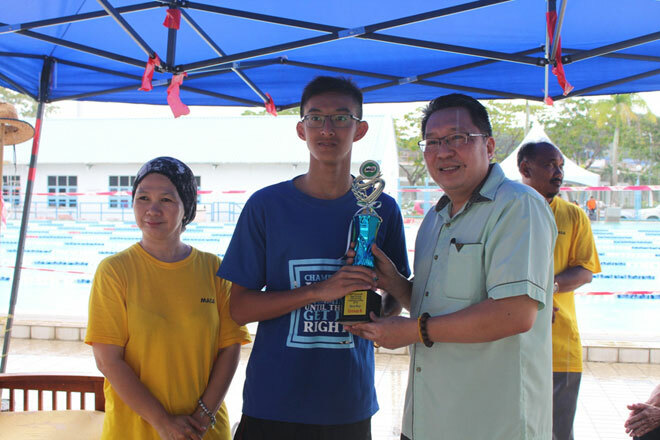 “All of a sudden, various swimming clubs are mushrooming around, with all of them aspiring to turn Sarawak swimming into a powerhouse,” he said at the closing of the 45th edition of SAG swimming championship at the Miri Public Swimming Pool last Sunday. Wee highlighted that Asas heartily supported this endeavour but as a proper constituted association affiliated to Amateur Swimming Union of Malaysia (Asum), it needs to adhere to rules and regulations instead of trying to gain leverage or advantages using political influences. “In the modern day and age of e-learning, I also urge our association to be more flexible and adaptable to changes. “We have expanded our base on swimmer recruitment not only by territory but also by club association. “All the above gear towards a broader approach without fear and favouritism,” he added. In noting the change in the preparations for swimming in Sukma XIX which was undertaken by the Sarawak State Sports Council (MSNS), Wee expressed Asas’ gratitude to its affiliates for obligingly providing the swimmers to MSNS for their elite training programme. He also congratulated and thanked Masa for taking up the challenge to host a very successful meet which saw the participation of 281 swimmers from under eight years old to 17 years old from six affiliates. The three-day meet saw Limbang Amateur Swimming Association (Lasa) emerging as the overall champions for the first time in SAG history after they captured 42 gold, 35 silver and 36 bronze medals. Defending champions Kota Samarahan Amateur Swimming Association (Kotas) with 39-27-19 and Kuching Amateur Swimming Association (Kasa) 2010 with 33-41-33 finished second and third. Best boy swimmers were Zachary Tan of Kasa 2010 in Group A (15-17 years old) with six golds and two silvers, Hii Puong Wei of Kotas in Group B (13-14 years old) with 15 golds and one silver, Hii Puong Jie of Kotas in Group C (11-12 years old) with nine golds, one silver and one bronze, Jonas Lau of Lasa in Group D (9-10 years old) with five golds and one bronze, and Dylan Leong in Group E (8 & Under) with five golds and three new records in the 50m breaststroke, 50m freestyle and 100m breaststroke. Leong Wan Mei of Masa clinched the Girls Group A best swimmer award after she created one new record in the 50m backstroke, bagged six golds and three silvers while the other best swimmers were Zia Tan of Kasa 2010 in Group B with eight golds, two silvers and one bronze, Kelly Teo of Kasa 2010 in Group C with nine golds, four silvers and one bronze, Bibienne Ong of Lasa in Group D with five golds, one silver and four bronzes, and Janice Tan of Lasa in Group E with nine golds and two new records in the 50m butterfly and 100m butterfly.